I still remember the first time I attended the Charlie Parker Jazz Festival a decade ago. I was there on assignment for the print edition of All about Jazz (now the New York Jazz Record, which I left years ago because of their editorial choices at the time – I have not followed them since, and have not been in touch with their editors either). I remember hearing Odean Pope Sax Choir, Japanese pianist Hiromi, Geri Allen and others who at the time were pretty much unknown to mainstream jazz audiences. I have returned to the festival on an annual basis since even under heavy rain – something that often happens in late August and heard folks that were sometimes on the cusp of finding a bigger audience – examples of those include Jose James, Hiromi and Cindy Blackman. Others I saw are no longer with us, and quite a few disappeared without a trace. That is actually the beauty of the festival – it’s a mix of well-known and obscure names, each equally sharing the spotlight before a mixed audience that might be there out of curiosity or to hear the headliner. After all, how many chances does the average fan have to hear folks like Jeff “Tain” Watts, the late “Fathead” Newman or Esperanza Spalding for free outside of a pricey jazz club? I mean, I love places like the Jazz Standard, Dizzy’s or Birdland, but most are not affordable for the average non-tourist Joe – so festivals like these are a chance in a million to appreciate great music at no cost – especially when we are talking about marquee names. The show was fun to watch, and I especially liked the finale when he did an extended take on the classic Broadway tune “I’m Getting Married in The Morning” with lots of improvisation and Gospel-inspired backing vocals from his band members. 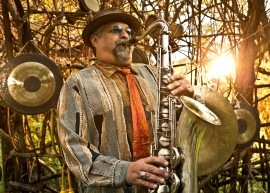 After a short break, Joe Lovano took the stage to great applause – he was backed by a quartet that included Esperanza Spalding. He didn’t seem to need much introduction. He stood around and waited for everyone to set up and barely gave time to the presenter to say a few words about him. He played a few notes, the band jumped in and the set went on, proving that Lovano deserves the legend label – he just mesmerized everyone with his music. I listened for a while and then had to leave – it was time to make dinner and get ready for another week of hard work.